So I had bought a 97 BMW 328i for $250. Was able to give it a clean, find out exactly what was wrong with it (primary O2 sensor, auto trans destroyed from never having fluid changed), and listed it on the good ole' Craigslist for $800. Ended up selling at $650, and funding a major part of finding a good project car. After selling the wheels and tires off my tC2.5 (that were a little to narrow and not enough side wall) funding the rest. 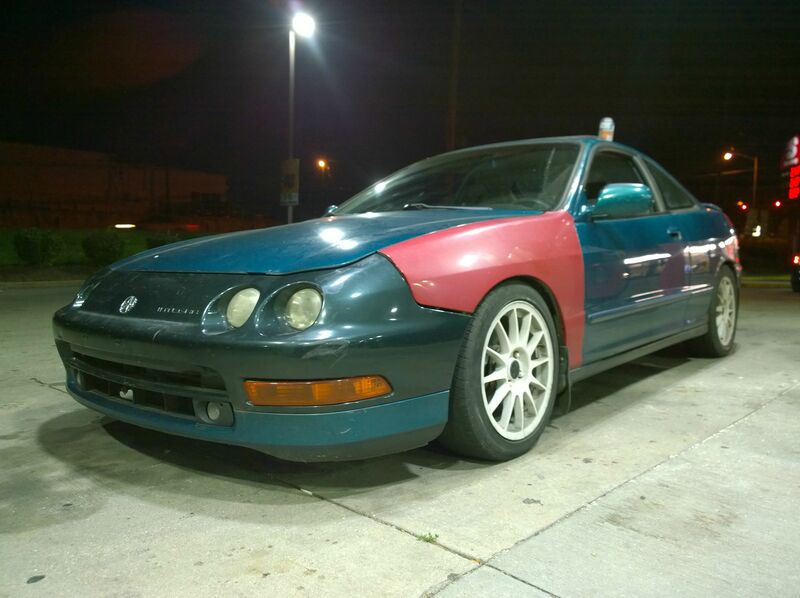 A quick browse around craigslist brings up a 5spd 94 Integra GSR. And knowing how good of a FWD car it is when it's in show room shape, I went to look at it. Listed at $1800, purchased at $1400 after a test drive. 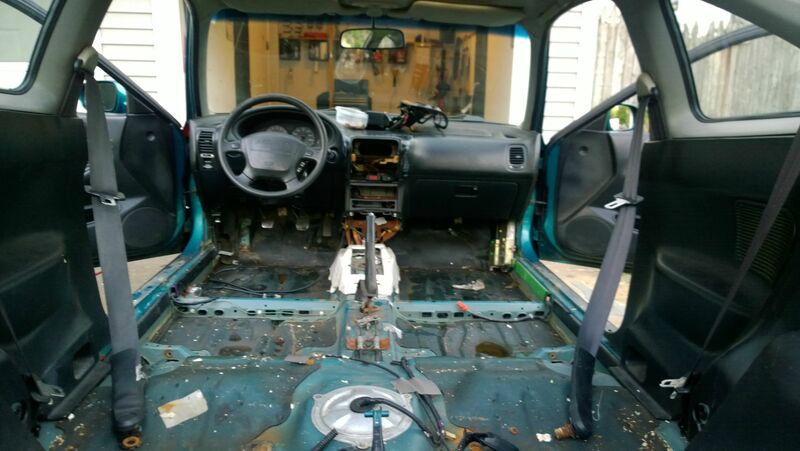 It has a long list of things that need fixed, updated, and upgraded, but the major concerns are dry rotted tires, upper engine mount, and oil burn. There is also a water leak somewhere in the car I need to address. I figured probably from the sunroof, but not 100% sure yet. 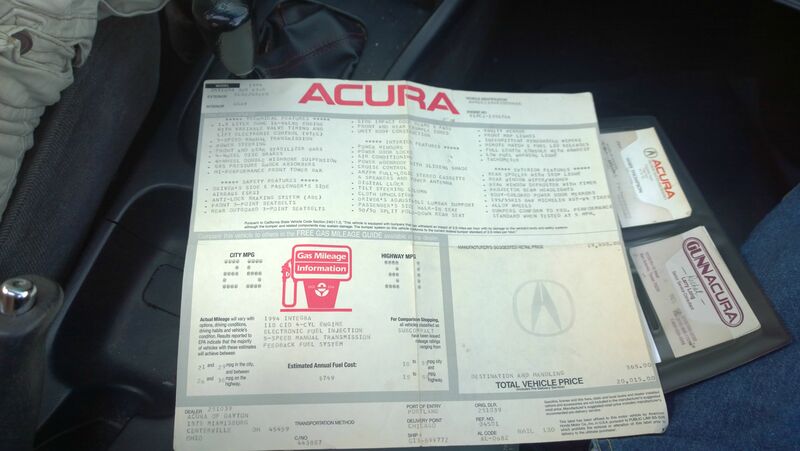 And then we found this cleaning it out: This is the 2nd used car I bought that still had the original window sticker. We were comparing it to my friends 06 tC with standard features. The only difference we had was CD player vs Tape deck. Oh and the GSR cost more in 94 that his tC did in 2006. Now with the aforementioned water leak somewhere, the carpet, and bottom of the rear seat were soaked. Got the water logged carpets and rear seat out, as well as the lake in the spare tire area. Once we got the front seats back in, my buddy Nathan headed out, and I put all the good interior pieces up in the attack. Grabbed the keys and took it out for some fuel for me and it. 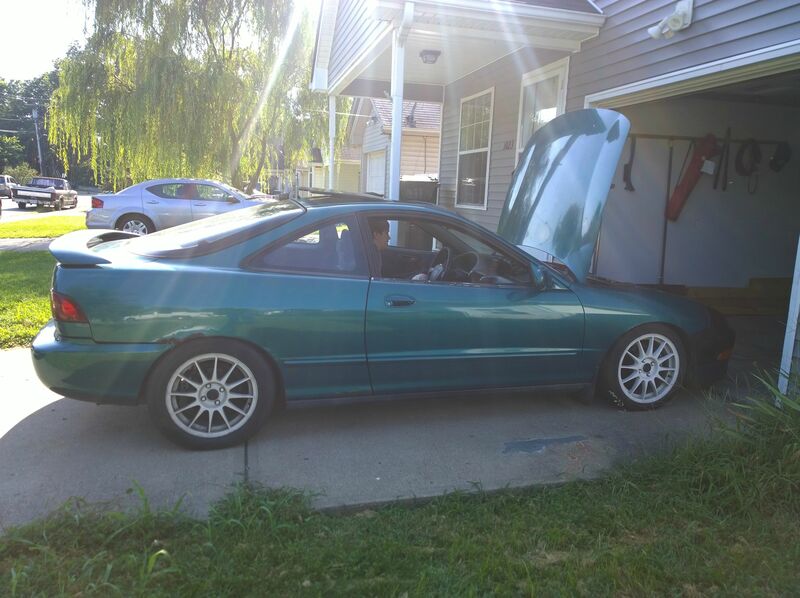 So I now own a GSR. Time to start shopping! (yes I know it's 2015 challenge friendly, but sadly making it to Florida isn't possible with having no vacation time left, and it being in Florida. So with that being said screw the 2015 budget, lets get building! Or something else, who knows, I change my mind a lot. Oh and it baddly needs rust repair in the normal Honda spots. Check your taillight seals for the leak in the back, along with the rear sunroof drains. My 94' GSR had issues with both, which filled the spare tire well, back seat, and carpet all with water. New seals are pricy but I made a set from foam at the fabric store that have been working pretty good. Nitroracer wrote: Check your taillight seals for the leak in the back, along with the rear sunroof drains. My 94' GSR had issues with both, which filled the spare tire well, back seat, and carpet all with water. New seals are pricy but I made a set from foam at the fabric store that have been working pretty good. Have fun with the new project! Sunroof almost seems like the perfect culprit, but good idea on the tail lights. Didn't think of that. So far we found that it had a different antenna base put on and didn't fit properly and couldn't be tightened to seal tightly. So it's yanked off right now. Also they deleted the rear wiper blade and the back window is taped over the hole. Again, another prone spot. So I am going to run to Lowes (it's all our town has locally) to try and find some sort of plug to put in both of these spots. Then drop the head liner and look for any drip passages. And now, pop off the tails and look. Of course, right now I'm not too worried about it, as I can park it in my garage. Means my nicer new car (2014 tC Monogram) has to sit outside in the elements with its nice black leather seats. But again, thanks for the Just the Tips. Oh and ran codes last night off the ECU. Code 3: MAP sensor Code 16: Fuel Injectors Code 23: Knock sensor. I am hoping that the Map Sensor is just causing a chain reaction, so I bought a new one from Autozone (although I know I really should use Honda parts to replace, I just don't want to drop that much on a Honda/Denso sensor. Just waiting on the ECU to reset and then I'll test it out. 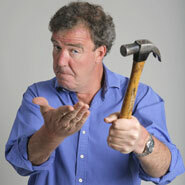 Had did all the hard work last night turning those pesky Phillips screws into Flat Heads. Fun fact they arent phillips head screws, they are JIS. Looks like a fun project, ill be keeping my eyes on it. Update: Drove it after the MAP install, car feels good. CEL is still on, but when I run the codes it just stays on. I suppose either bad or modified ECU causing this, being as it gave me the code for the MAP sensor prior. I guess I will remove the ECU and crack open the case to see if I see a different chip set or maybe a hondata or hondata like device. Also I heard some brake squeaking coming from the rear, and the pedal is very firm. 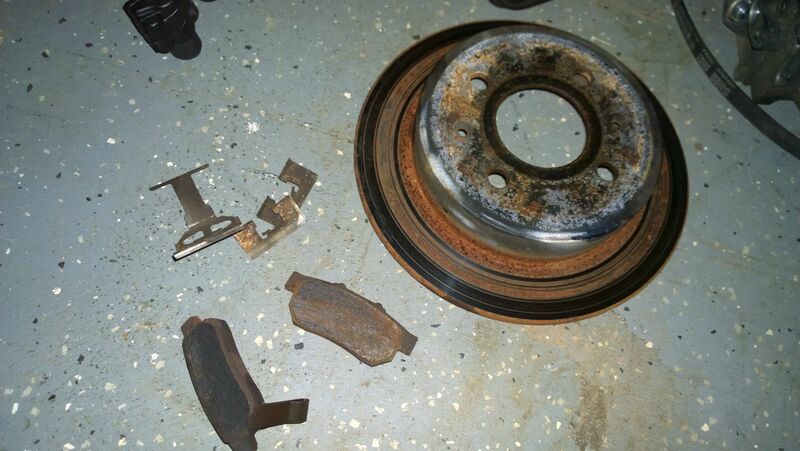 Looked at the rotors and I have 2 nice clean spots, and a rusted stripe between them. If I tap the brake the squeak goes away so looks like I've got a sticky rear caliper. Not the first thing I wanted to put on the build list, but eh, it was in the plans to upgrade all 4 rotors and pads. Something slotted with Hawk HP pads likely. And once I cut the grass and eat some food (while the weather cools down), I am going to pull the non-working A/C. Dead weight is dead. Did a little work tonight on shedding some weight. It's either I lose weight, or the car does, and well, I like pizza. That is most of the engine bay A/C items. Not a terrible amount of weight reduced, but at least it'll take some strain of the crank pulley by having one less belt on. After the brake issue is resolved (as earlier mentioned) it'll be time to add some nice new motor and transmission mounts. The lower engine mount is toast. Not even sure if the rubber is connected anymore. But the other 3 seem to be in good shape. Just a quick update. Finally got the brake kit on order from StopTech. A full front/rear set of SS lines, 4 slotted rotors, and 4 sets of pads. Debating on just replacing all 4 calipers as well just so I know they are new and going to take the abuse. For the rear wiper delete you can install the rubber grommet plug that is next to the baterie on the firewall. A perfect fit. With some sealler, it worked for 3 years for me with no leaks. You can also try to source a 97 type r rear window. It do not have the hole. Good luck getting a good price.. or replace with a lexan rear glass.. it is heavy! I was looking at the FAL windows. Side 1/4's and rear mainly. Although they do say they are not for use on street, I think KY law says only the windshield has to be glass. (I.E. why convertibles have the plastic windows) The weight savings on a lexan/plexiglass rear hatch window would be awesome, but for the same price I can get a OEM carbon hatch, save the same weight, and remove the spoiler holes that I have created by removing the rear spoiler. (Oh yeah, I removed the rear spoiler) If I keep the car long enough and feel it needs it, I'd love to get the 3D Carbon one they use on the J's Racing GSR/ITR. And I'm not going to lie, I was enjoying a smoke last night after work (nothing illegal) looking over the car and thinking. The thought of replacing as many panels with C/F as possible did cross my mind. Then when I seen the doors were 2K, and a OEM hood is $500, hatch at $700, and fenders at $400 that option left my mind. At that price, I could of just bought a GSR in way better shape. Welcome to the incredibly small integra owners club here on GRM. I'll second the brake light gaskets - I've done those on more than one DC2. Not sure what you have in mind suspension-wise, but I basically tried to piece together something similar to the Type-R setup with aftermarket parts since the cast-offs seem to have dried up when I was shopping (although I now see sets on ebay). The H&R OE Sport springs were about as close as you can get to the R rates-n-drop although the front definitely seems lower than the advertised 0.75". I paired them with Koni sports and have been really happy with them as a dd setup, even in moon-cratered ATL. Suspension wise, I'm thinking coilovers. But if I can piece together a good adjustable set of shocks with proper springs and pillow ball top hats, I'd like to do that. Just haven't really dug in that far. Right now my main concerns are getting the brakes on (should be arriving at Endurance Motorsports Saturday for me to go pick up), and then the motor mounts. From there I really need to do a compression test and try to find out where my oil burn is, and why am I running a bit rich. Took the PCV valve out last night and gave it a clean, but didn't seem to help anything. A dc with no wing can get twitchy at speed. Even more when braking at speed. physician wrote: Carbonfiber... a lot of money for the weight saved... you can gut the doors for free.. it will still be heavier but the money saved can be put on a used carbon hood,suspension and tires... Its your money :) For the hatch.. how about the fiberglass hatch AND the rear lexan ? :D A dc with no wing can get twitchy at speed. Even more when braking at speed. Yeah it was starting to dance a little tonight at about 70mph. But I am currently counting that towards suspension ware and crap tires, and not aero. At least for now. Also I swapped my Scan Tool for a Compression tester for a few days with a friend at work. The results are in, and You ARE the father! Wait, no, that's not right. Looks like I am low on compression but with in tolerances. That dry test on Cylinder 2 was probably about 1/2 to 1 crank less than the other 4. And results were done on a warmed engine. I am going to redo the test Friday night or Saturday afternoon to test results on a cold motor, and try to be more consistent with my methods (more so with the wet test). Also I noticed the sparkplugs were NOT NGK. I am not a Honda guru my any means, but I know you should almost always run NGK plugs! But on the plus side, it looks like the gaskets are still in tack, but the rings or valves may be dumping compression. I heard a little ticking earlier today so I am sure the lash needs adjusted, but don't think that would effect compression test. But a burn/worn valve seal seems like a more likely culprit. I noticed today with the engine running and the oil cap off air pushing out heavily from the oil cap, and could smell gas. Maybe a spark plug/valve combo. I've always been attracted to this generation of Integras, much more so than most other Honda cars. I'll be watching. I hear you on the suspension - it sounds like you have a bunch of other stuff to take care of first. On the subject of coilovers, I'll just say that I wouldn't trade proven damping characteristics over height and travel adjustments. Not sure what your budget is, but at the low-end it's a false economy imho. I'll get off my making-ASSumptions-buying-cheap-coilovers soapbox now. physician wrote: A dc with no wing can get twitchy at speed. Even more when braking at speed. Really? Never heard or experienced this before. I've had three and as long as the suspension is healthy they've all be very stable approaching the three-digit mark, even under emergency maneuvers. Admittedly, two of them had the stock GSR "spoiler", but I'd be really surprised if that thing did anything more than add drag. Last night while compression testing I seemed to have left the ignition on. OOPS! Dead battery! So crap, no biggie, I'll just put off doing the cold compression test. That being said I did manage to stick the flashlight down into the spark plug hole and look at some of the piston. Yuck. Lots of crude on it from the oil burn. Still not sure on what's causing it. No air compressor means no leak down testing, and tracing air leaks to exhuast/intake valves or piston rings. Something on my "to buy list" but just haven't had the time too. Never had to place to put a moderate sized compressor or a garage to work in before, but now that I own my first home (about 3 months into ownership) I can work up to that. As well as getting a moderate welder and learning to weld! Now most of the above isn't much of an update. Just a "nice job leaving the key on all night dummy". But fear not readers, I did do SOMETHING tonight of progress. My Stoptech Brake kit should be at the shop now, and I plan to drive an hour up there to pick up the parts, spit ball some idea's with the head mechanic who is a Honda Guru, and maybe price out some work that I can't do my self. I also wanted to take a look at the worse brake (right rear) before I headed out to see if I needed to get a caliper or not. The caliper seals looked good! That's a money saver. The noise I thought was a sticking caliper ended up being the ware indicator. I'm used to seeing these on the outside pad so you can inspect with out removing the wheel, but this indicator was installed on the inside and I didn't realize it was rubbing that bad. Who likes pictures from a cell phone? For some reason though, the right rears are worn much more than the left rear. The left rears almost look like new pads. 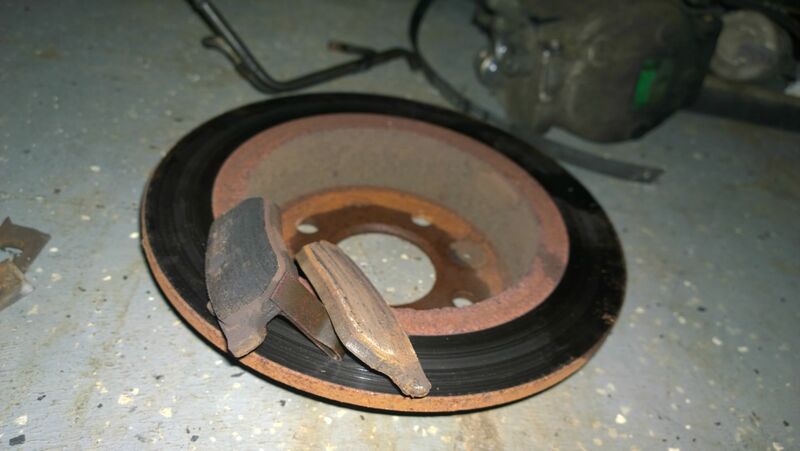 So I am not sure if someone just half did a brake job, or the left caliper has an issue, or maybe there is a air bubble in the system that wasn't fully bleed. And there is no codes from the ABS system. I suppose I shall find out tomorrow. Oh one more thing before I hit the showers and call it a night. I knew the ride height was altered when I bought it, but looking at it from under the car with the wheels on before I bought it, I couldn't tell how or on what. When I pulled the wheel off tonight I seen a nice set of Tein Green springs. Pulled one of the rubber spring pads off (that wrap around the coil) and low and behold Tein Sports! 6KG front 4.9KG rear. (335/274) significatly more firm in the front than the ITR and slightly more firm in the rear as an ITR. I do like they way they ride, but do think it's time to throw new shocks all around as well as all new control arms and bushings, not to mention sway bars. Picked up some my parts today, and since it was sitting on a shelf taking up space and collecting dust, I added a A-Spec Racing rear tie bar to the bill. Also sat down and worked out some future modification plans with Mike the head mechanic. Basically he's help me decide on going to TruHart suspension components. So control arms, and coilovers will likely be ordered over the next few months. Desy wrote: An update for tonight: (I work nights, so most of my work is done while you guys/gals are sleeping) Last night while compression testing I seemed to have left the ignition on. OOPS! Dead battery! So crap, no biggie, I'll just put off doing the cold compression test. That being said I did manage to stick the flashlight down into the spark plug hole and look at some of the piston. Yuck. Lots of crude on it from the oil burn. Still not sure on what's causing it. No air compressor means no leak down testing, and tracing air leaks to exhuast/intake valves or piston rings. Something on my "to buy list" but just haven't had the time too. Never had to place to put a moderate sized compressor or a garage to work in before, but now that I own my first home (about 3 months into ownership) I can work up to that. As well as getting a moderate welder and learning to weld! Now most of the above isn't much of an update. Just a "nice job leaving the key on all night dummy". But fear not readers, I did do SOMETHING tonight of progress. My Stoptech Brake kit should be at the shop now, and I plan to drive an hour up there to pick up the parts, spit ball some idea's with the head mechanic who is a Honda Guru, and maybe price out some work that I can't do my self. I also wanted to take a look at the worse brake (right rear) before I headed out to see if I needed to get a caliper or not. The caliper seals looked good! That's a money saver. The noise I thought was a sticking caliper ended up being the ware indicator. I'm used to seeing these on the outside pad so you can inspect with out removing the wheel, but this indicator was installed on the inside and I didn't realize it was rubbing that bad. Who likes pictures from a cell phone? For some reason though, the right rears are worn much more than the left rear. The left rears almost look like new pads. So I am not sure if someone just half did a brake job, or the left caliper has an issue, or maybe there is a air bubble in the system that wasn't fully bleed. And there is no codes from the ABS system. I suppose I shall find out tomorrow. Oh one more thing before I hit the showers and call it a night. I knew the ride height was altered when I bought it, but looking at it from under the car with the wheels on before I bought it, I couldn't tell how or on what. 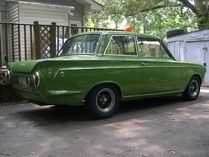 When I pulled the wheel off tonight I seen a nice set of Tein Green springs. Pulled one of the rubber spring pads off (that wrap around the coil) and low and behold Tein Sports! 6KG front 4.9KG rear. (335/274) significatly more firm in the front than the ITR and slightly more firm in the rear as an ITR. I do like they way they ride, but do think it's time to throw new shocks all around as well as all new control arms and bushings, not to mention sway bars. Well.. twitchy may not be the right word... it just felt more stable with an itr wing... sorry for the confusion. Yeah I am going to work on the suspension technicalities later. That ASR brace is for the rear sway bar/cross member. So once I finish the brake job, that will go on next. Then I'll start ordering the needed suspension parts (Control arms, camber kits) and get them on. Then get the coilovers, sway bars, bracing, roll center adjusters, and 4/6pt cage (undecided). And somewhere in the middle of all that, wheels and tires. And that's just the suspension part. So moving onto where I am at now. Rear brakes disassembled. Problems thus far include: LR Stripped brake line nut (where the hardline meets the hose). RR Frozen lower caliper slider. Haven't attempted to hook up the RR stainless line yet since I had issues from the LR. So the rears are not treating me good. I really wanted to get the grass cut sometimes before it got dark so I ended up calling it a day on the brakes. I've yet to even jack up the front of the car and look at the fronts. Who knows what challenges those will throw. 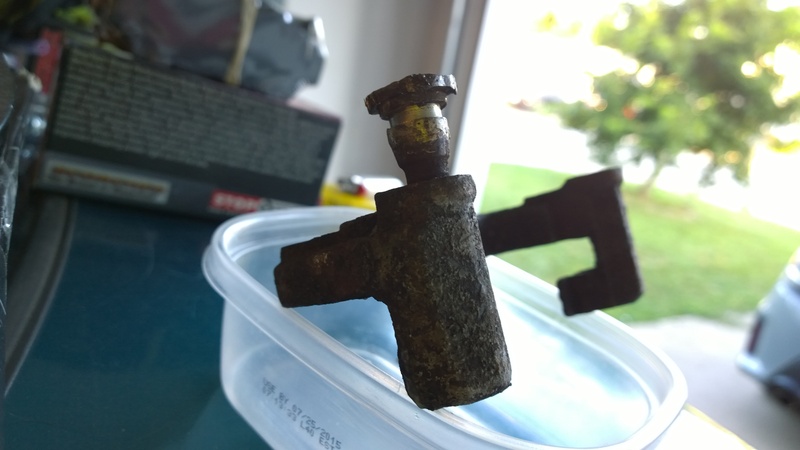 I've heated the crap out of the caliper bracket, let it soak in PB Blaster overnight, hit it with a hammer, tried to turn it with a wrench, tried to hit it with an impact and socket, even vise grips. 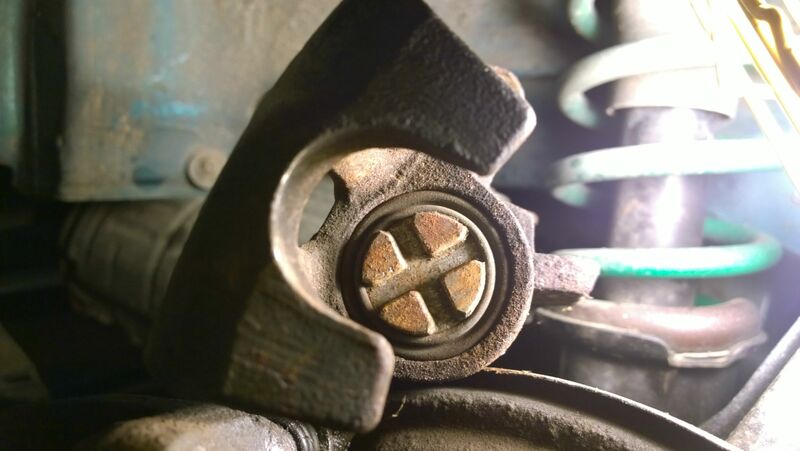 But yet this stupid bolt is just seized in there. So looks like it's time to source a new caliper bracket and slider pins for the LR. But this now explains why the LR brakes wore so much faster than the RR. I spent some time yesterday helping friends accomplish stuff, and now that it's my turn to accomplish stuff, I get no luck. We put long tube Texas Speed headers on a C5 vette at Endurance Motorsports with pretty much no issues. Fought a rear differential install on a FC Rx7 convertible, but managed to get it in. And I can't get a stupid bolt out because somewhere along the lines of ownership, someone didn't want to grease a freaking pin. $2.00 for a package of grease is about to cost me way more. Well the FL brakes went with out a hitch. That was kind of nice for once. 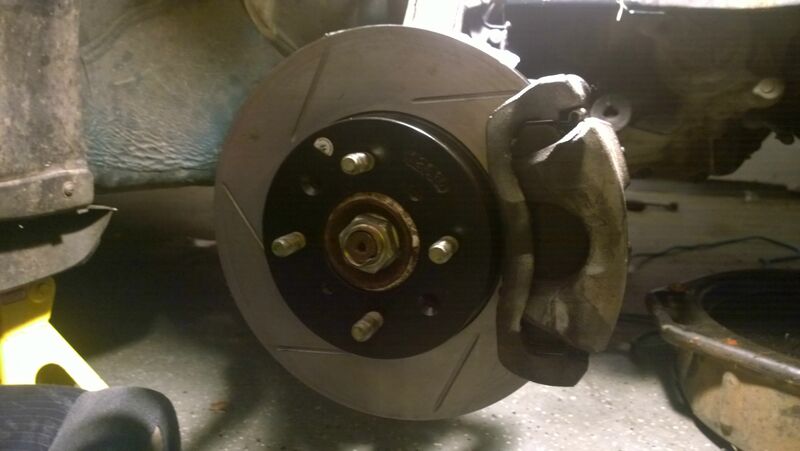 But then I got to the FR brake and it was the only rotor still to have the rotor retaining screws in. And if you've ever dealt with those, you know how fun they are! Tried a couple of methods of removal, the proper way, the punch way, and neither of those methods worked. That leaves one option. Drill baby drill. After destroying every last good drill bit I had left, I finally got those pesky little boogers off. 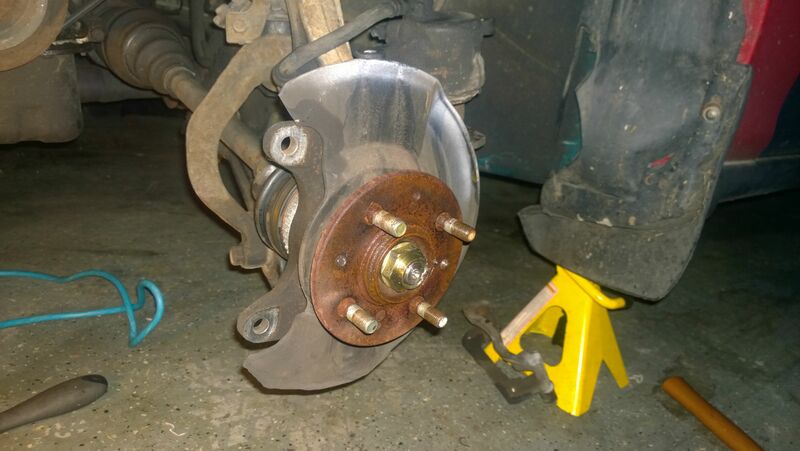 It's about time for me to go to bed so I figured tomorrow after work I'll finish up the install of rotors and pads. Shouldn't have any hang up there just set the pads, line up some brackets and snug everything up. I'll be glad to be able to move onto installing the rear reinforcement and put the first steps of suspension upgrades into motion. But still have a long way to go. 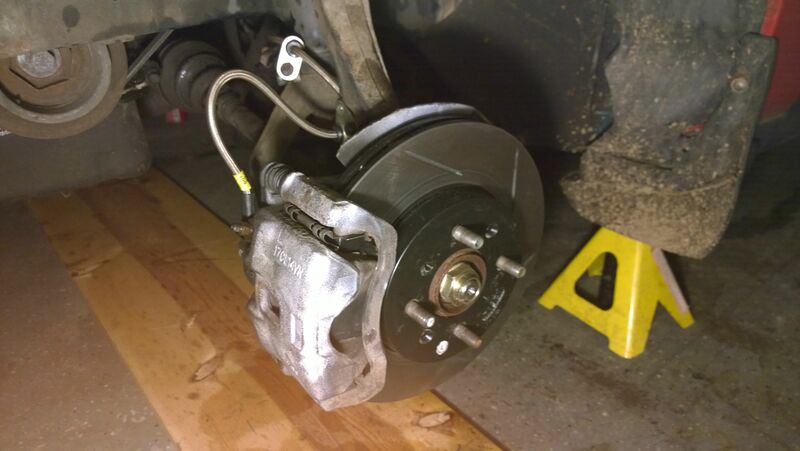 Still need to install all the stainless lines, and when the new bracket arrives (ordered from RockAuto for a whopping $30 including shipping, 2 new bolts, and 2 new dust covers) I can finish up the right rear brakes. TADA! Fronts should be done. I took it for a drive last night before putting the SS Lines on tonight, and great brake feel. Did a little parking lot auto-x at the park at the end of the road. Sure anyone up that seen my headlights doing hairpins back to back in the parking lot at 4am was confused as can be. But was able to get some heat into the pads/brakes with a couple of quick acceleration burst to a dead stop. Felt good. However I had discovered a grinding noise (metal on metal) and had to tare the LF down again to find the source. Seems I bent one of the pad retainers in when I put the pads on, and was causing them to hit the rotor. Derp. So all that's left is the rear lines, and a bleed. I was pretty pleased to get all that old nasty fluid out as it was pretty brown, and looks like was starting to collect rust from the hydraulic lines. Tomorrow I'll go pick up another bottle of DOT4 fluid and finish the bleeding the system upfront, and give it another run. Probably give the ABS system a few more cycles on bleeding as well just to flush out the remainder of the old fluid. I've collected almost 40oz's of fluid during all this. And lord knows how much the floor has collected. After the brakes, I attach the rear sub frame brace. Oh and I still need to get my lower motor mounts. One thing at a time!